(Nanowerk Spotlight) As the semiconductor industry continues to miniaturize in following Moore’s Law, there are some real challenges ahead, particularly in moving deeper and deeper into the nano length scale. In particular, sustaining the traditional logic MOSFET (metal-oxide-semiconductor field-effect transistor) structure, design, and materials composition will be especially difficult, particularly beyond the 22 nm node. Nanocables, consisting of a range of materials, offer potential solutions to these problems and may even be an alternative to today’s MOSFET. A group of researchers from several European countries now reports the synthesis of a magnetically tunable nanocable array, combining separate hard and soft magnetic materials in a single nanocable structure. The combination of two or more magnetic materials in such a radial structure is seen as a very powerful tool for the future fabrication of magnetoresistive, spin-valve and ultrafast spin-injection devices with nonplanar geometries. Many current integrated microelectronic circuits consist of arrays of devices constructed from semiconductor heterostructures in two dimensions. Further miniaturization of electronic circuits, to facilitate Moore’s Law, may necessitate the construction of appropriate devices in single dimensions. Consequently, the development of one dimensional (1D) coaxial nanocables, which consist of a continuous crystalline nanowire encapsulated in a sheath of a different crystalline material, has been the focus of extensive research, as these structures are expected to play an important role in the next generation of electrical heterostructured devices. In particular, the combination of two or more magnetic materials in a radial structure is seen as a potential building block for future magnetoresistive, spin valve and ultrafast spin injection devices with non-planar geometries. Dr. Justin Holmes, who leads the Supercritical Chemistry Unit at University College Cork's Department of Chemistry, explains the team's findings to Nanowerk: "We developed a supercritical fluid inclusion technique for constructing highly ordered and oriented arrays of coaxial magnetic nanocables, consisting of both magnetically hard (cobalt) and a magnetically soft (magnetite) materials. Significantly we demonstrate that the magnetic properties of these structures are determined by the material occupying the largest volume fraction, i.e. the core of the nanocable. Hence, it is possible to control and optimize the magnetic properties of these structures." The team produced high-density arrays of Co/Fe3O4 and Fe3O4/Co coaxial nanocables up to 60 µm in length. The coaxial nanocables consist of either two discrete layers of a ferrimagnetic core surrounded by a ferromagnetic sheath or the converse. Both structures demonstrate ferro- and ferrimagnetic properties at room temperature with the saturation magnetization up to 20% lower than expected for the bulk material. The magnetic properties of the heterostructures are mainly determined by the material occupying the larger fraction of the volume, that is, the core of the nanocable. The synthesis of the coaxial nanocables was undertaken in a two-step process. Firstly, the initial sheath precursor was deposited onto the walls of anodic aluminum oxide nanopore membranes to form nanotubes. These were subsequently filled with the core material to form arrays of coaxial nanocables through the newly developed supercritical fluid inclusion-phase method. 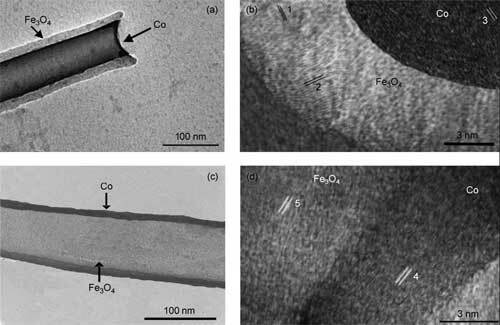 A paper describing the findings, titled "Synthesis and characterization of highly ordered cobalt-magnetite nanocable arrays", was published in the September 18, 2006 online edition of Small. A related paper by the authors describes germanium–cobalt core shell nanocable arrays ("Structural investigation of germanium–cobalt core shell nanocable arrays"). Building on this research, Holmes points out that they will attempt to achieve four important goals: i) the synthesis of other highly-novel nanocable structures in massively ordered arrays using directed assembly methods to avoid the use of ‘top-down’ lithographic techniques, ii) determination of the properties of these novel nano-materials, iii) the use of these materials properties and cylindrical shapes to realize novel device concepts and finally iv) the preparation of a roadmap with recommendations on nanocable-based applications, including process and analysis methodology, and device type.